The stately cliff of red-stained limestone is both a popular formation and a barrier to travel. Massive jutting overhangs form alcoves that only birds may visit, as most of these shady stadiums are just under the top of the cliff. 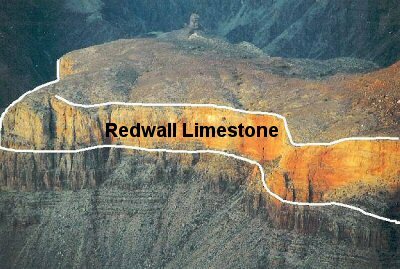 The Redwall (and underlying Muav Limestone) are the chief cave-forming units of the Canyon, with small to large entrances visible from nearly any rim viewpoint. The Redwall Limestone has a gray color, but almost everywhere it is stained red by iron oxide washed from the red, iron-rich layers above (Supai and Hermit Formations). Like most limestones, the Redwall is formed mostly of the calcium carbonate shells of sea creatures. When the animals die their shells fall apart in the waves or currents, or even dissolve and re-precipitate as lime mud. But some of the creatures' remains are preserved as fossils. Crinoids, corals, brachiopods, bryozoans and foraminifera are the most common in the Redwall. Pure, thick-bedded limestones like those of the Redwall are usually deposited relatively far from shore. The sea had encroached far inland during this period. Yet shallow-water fossils are present throughout the formation. This shows that the water was never very deep--probably at maximum 300 feet. How can 450 feet of limestone accumulate in 300 feet of water? Offshoresubsidence is the key. As the sea floor slowly subsides, lime muds slowly accumulate, keeping the water depth approximately constant during the entire deposition. In this way, a thick sequence of rocks can form entirely in shallow water. The following story pretends that people were alive when this formation was laid down. But it was long before people. The purpose is to immerse ourselves in the time period--to imagine being there. One time I counted to ten thousand. I was sitting on our shore counting crinoid stems, the little beads that the storm waves cast up on our beach. Each stem fragment has a little hole in the center and we string them into necklaces. Once a year, far to the east, there is a clan gathering and we take our crinoid jewelry for trade. They give us a thing called dried amphibian--a rich protein source from a small fish-like creature that actually walks on the land and breathes air like us.